When I first started this blog back in 2014, my main goal was to write as much as I could about yerba mate. I wanted to pass on the little I knew about my favorite drink. I had no idea, that my ideas would propagate so far and put me in contact with so many interesting people, who happen to share the same passion I do: yerba mate. One of such people is Mark Dansie from Utah, who got in touch with me about a month ago and shared his amazing story about how he transformed his passion for yerba mate into a lucrative business. After exchanging a few emails, Mark agreed to share the details of his 10-year journey down the yerba mate path. So without any further delays, let’s meet Mark, shall we? Mark has been drinking yerba mate every day for more than ten years and it all started at a round table in Walmart in Utah! Huh?! A Walmart in Utah?!? How on earth did that happen? “Each day 6-7 of us would be sitting in the break room drinking Yerba Mate traditional style at breaks and lunch. We even got our assistant manager into it so much that we started buying him Yerba Mate and soon his very own setup. This is where it started and yes many people would walk by and ask… What are you drinking?” – Mark explains. So the years went by and Mark kept on drinking his yerba mate. His circle was made up of a mixed cultural group that had lots of fun eating, drinking mate, and laughing each day. The truth is that nothing lasts forever and as the years went on Mark’s circle buddies all moved around and on to other places, yet through the years they have kept in touch. To this day Mark is still very close to one of his original yerba mate circle friends and they still get to together to drink mate. Mark’s very first mate setup was given to him by one Argentine of his group. This happened after a shared dinner at his place. 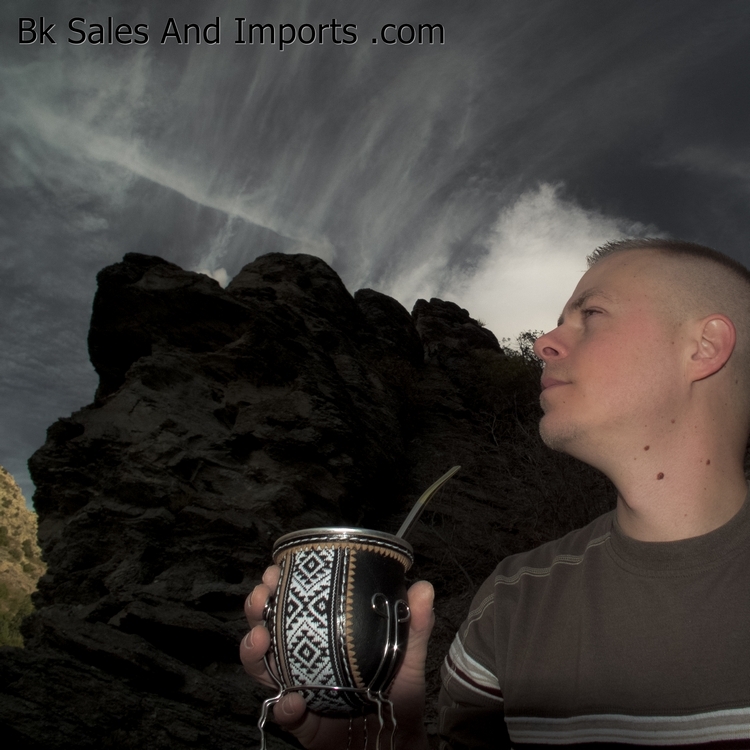 Soon he began buying more than 2 kilos of yerba every month and a few more mate cups! This quickly led him to having close friendships with the owners of local Argentinian market. Moving forward, year by year Mark started building his own personal yerba mate collection and getting many other people into it. Over the years, Mark has tried more than 25 different yerba varieties and has kept on collecting yerba mate products to this day. This all eventually led me into sharing this experience as a USA based international shipper of high quality hand made yerba mate kits. He now sells kits ranging from simple gourds, carved gourds, glass gourds, leather wrapped pongos and metal wrapped wooden gourds. I hope you guys have enjoyed Mark’s story as much as I did. If you are interested in purchasing high quality gourds in the United States or having them shipped Internationally, then Mark is the man to talk to. You may contact him directly through the BK Sales & Imports Website or visit his eBay shop here.